This paper presents the initial characterization of a new burner design to study the effect of non-thermal plasma discharge on combustion characteristics at atmospheric pressure. The burner allows stabilizing an inverted cone flame in a mixture flowing through a perforated plate designed as a microplasma reactor. The design principle of the microplasma reactor is based on the dielectric barrier discharge scheme which helps to generate a stable nonthermal plasma discharge driven by nanosecond high-voltage pulses in the burner holes. The consumed power and pulse energy have been calculated from simultaneously measurements of current and voltage of the electrical pulses. Time-resolved measurements of direct emission spectra for nitrogen second positive system N2(C-B) have been done to determine the rotational and vibrational temperatures of the plasma discharge. By fitting the spectra with SPECAIR simulation data, it was found that the rotational and vibrational temperatures are 480 K and 3700 K, respectively, for the discharge in methane-air mixture with an equivalence ratio of 0.5 at atmospheric pressure. The influence of a high-voltage (5 kV) pulsed nanosecond discharge on the laminar burning velocity of methane-air flame has been investigated over a range of equivalence ratios (0.55–0.75). The laminar burning velocity was calculated by the conical flame area method which has been validated by other published data. CH* chemiluminescence image analysis has been applied to accurately determine the flame area. The results show an increase of the burning velocity of about 100% in very lean (Φ= 0.55) flames as a result of the plasma discharge effect. Elkholy, A, Shoshyn, Y, Nijdam, S, van Oijen, J, van Veldhuizen, E.M, Ebert, U, & de Goey, L.P.H. (2018). 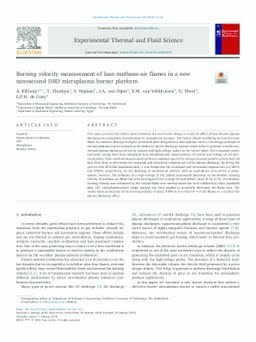 Burning velocity measurement of lean methane-air flames in a new nanosecond DBD microplasma burner platform. Experimental Thermal and Fluid Science, 95, 18–26.